History, Characteristics: 20th Century Sculptors in Britain. The break with traditional naturalism was only part of a new movement in art which was later to become accepted and adopted on an international scale. This movement started in Paris towards the end of the nineteenth century when interesting things began to happen to painting. Artists were beginning to work in new ways which were quite against the accepted traditional methods of the time. These experiments in painting, which were later to spread to sculpture, were to have very far-reaching consequences indeed. In fact they were to change the whole conception of art for the twentieth century, and usher in a new set of modernist aesthetics which would continue changing for the rest of the century. The British public were first exposed to these trends in modern art in 1910, through a series of exhibitions arranged in London by Roger Fry, one of Britain's leading art critics. By this time the original modern art movement, Impressionism, was changing into a second movement, different again, known as Post-Impressionism. The first movement was concerned almost exclusively with painting and natural realism, but the second was also to provide the first experiments in plastic art away from the traditional methods of working and seeing. At the beginning of this century the British public were remarkably resistant to changes of any kind in matters concerning art. Even the paintings of the Impressionist school, by then long established and highly thought of in other countries, were not taken at all seriously in England at that time. And having failed to accept the easily understandable Impressionists, who painted realistic recognizable subjects in a direct unplanned way, the British public was hardly ready to understand the Post-Impressionists, who were attempting to reject imitation and traditional realism in art altogether. So that although these first exhibitions of modern art - like the Armory Show in New York - opened the eyes of a few artists working in England, the reaction was in general one of furious disapproval. In fact the storm created by the first sight of 'modern art' (as it was then labelled all those years ago) in this country has hardly died down to this day - and for a very good reason. For from that time onward, art was to become more and more of a specialist activity and therefore more and more difficult for the untrained person to understand. Put quite simply, the reason for the almost unanimous disapproval of the new movement was the difference between representational art, which represented natural things in a recognizable way which everybody could understand, and non-representational or abstract art, which did not, and which very few people at that time could therefore be expected to make head or tail of. Let us first admit that the easiest possible way of judging any work of art is by its likeness to natural recognizable things. If that simple method of judging art is taken away the average person loses the only standard of art criticism which he knows. We can now perhaps begin to understand why modern art caused so much ill feeling, for as all works of art were representational at that time in England, almost everybody could consider himself entitled to hold firm opinions on art, even if he had never been inside an art gallery or seen an art exhibition in his life. This also explains why it was not 'abstract' art (or non-representational art) which was to cause the average person so much irritation but those more numerous works which came somewhere between the abstract and the recognizable - works in which the artist used recognizable natural things but had distorted or even rearranged them according to what he felt his work needed. This really infuriated the public of that time. Purely abstract work they could ignore as having no pictorial or illustrative interest. The works portrayed nothing recognizable and therefore there was nothing in them to hold the attention of the general public or for them to talk about. Distorted work was another matter altogether, for it showed recognizable things deliberately made to look wrong. Distortion was therefore a direct insult to the public's knowledge of how things should look and therefore a direct insult to their status as art critics. Distortion, particularly of the human figure, left the average person no answer except ridicule, and in the circumstances ridicule itself was to become ridiculous. For, without being foolish, we can't point out as a mistake that the hands on a sculpted figure are too big when they are twice as big, or that the sculptor has made the head too small when it is only half the size it should be according to normal human proportions. Distortions of such magnitude were clearly deliberate and part of the sculptor's definite intention. All this may help to explain why the new movement in art met with such resistance in Britain and why, twenty years after its introduction to the British public, people still felt strongly enough about 'modern art' to deface a work carved by the first modern sculptor to practise in England. The work was the memorial in Hyde Park to the naturalist W. H. Hudson. The sculptor was that most controversial artist Jacob Epstein, who was a dominating figure in British Art almost until his death in 1959. Epstein was also responsible for the figures 'Night' and 'Day' which he carved for the St. James's Park Underground Station. In the Tate Gallery there is a bronze by him called 'The Visitation' and there is another magnificent bronze, 'Madonna and Child', at the Convent of the Holy Child Jesus in Cavendish Square, London, which he modelled in 1952. Epstein's stone sculpture provoked a passion of public dislike and press denunciation with every new work. His modelling for portrait busts and bronzes, on the other hand, being more representational, less distorted and therefore less in the modern style, enjoyed considerable favour. The free brilliant handling of the modelled portraits, much in the manner of the great French expressionist sculptor Auguste Rodin (1840-1917), was especially admired. These are also excellent portraits, being unmistakable 'likenesses', and are most original and inventive in composition and technique. People could not reconcile the undeniable artistry and technical assurance of his modelling with his stone carvings. The strong design qualities of these carvings with their sculptural simplifications and uncompromising distortions always brought a storm of public protest. 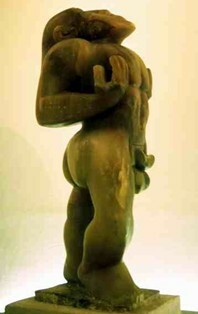 In fact, during the 1930s one of these works, a figure entitled 'Genesis', actually earned money in a Blackpool side-show where it was exhibited, not for its sculptural or aesthetic qualities, but for its popular shock value as a 'hate' object. Drawn to serious works of historical and Biblical art, Epstein's greatest and timeless masterpiece is the monumental Biblical statue entitled Adam (1938, Harewood House, Leeds, UK). Other examples of his Christian art include: Lazarus (1947-48, Oxford, New College Chapel); Christ in Majesty, 1954-5, Llandaff Cathedral); and St Michael and the Devil (1956-8, Coventry Cathedral). Modern art was made more acceptable to art lovers in the works of Eric Gill, whose use of its simplifications and distortions was much less aggressive than Epstein's. Like Epstein, Gill was a direct carver. In fact Gill would hardly admit that anyone who modelled a statue first in clay and then let someone else copy it in stone was a sculptor at all. His work is always very consciously 'designed' but his figures are always representational and the style in which he worked is much nearer to traditional sculpture than to modern sculpture. His work provided a neat compromise between the traditional and the new which proved completely acceptable to a large number of people in this country. There are many sculptors still working in this way, using representation strengthened by the design, simplification and distortion devices of some of the earlier forms of modern sculpture. Some of Eric Gill's public art sculpture can be seen on Broadcasting House. It represents Prospero and Ariel, the old man and the Sprite from Shakespeare's The Tempest. Another group of the same subject is in the Tate Gallery. Gill was, however, perhaps at his best in bas-relief, and examples can be seen in London at the Catholic Cathedral at Westminster. He carved 'The Stations of the Cross' for this building during the First World War. By far the most important of the modern English sculptors, however, was Henry Moore (1898-1986) , who had his first exhibition in 1928 and in due course established an international reputation as one of the greatest 20th century sculptors. His work varied between semi-representational sculpture and formal non-representational or abstract sculpture. Noted above all for his exploration of biomorphic abstraction, a great number of his works were based on the subject 'reclining figure'. At times these carvings are clearly recognizable as human figures, in others the form is cut into with holes, and parts of the figure are even removed completely, others again appear as groups of natural-looking stones or boulders which hardly seem touched by the sculptor's chisel. All, however, whatever the style, strongly convey the sense of the presence of the figure. We are told that the most important thing to Moore is the material he uses, the stone itself. He explained that the curving shapes and natural holes in stones - the way in which wind and water have worn them - fascinated him, just as the mysterious caves in hillsides and cliffs do. There are examples of Moore's work in the Tate Gallery. One is called 'Recumbent Figure'. It has the curves and holes which weather-worn rocks have, and yet does suggest a woman lying on the ground. Other works in London include a 'Draped Reclining Figure' and an abstract screen in Portland stone at the Time-Life building. There are many examples also to be seen at the Tate Gallery. A particularly fine example of Moore's bronze sculpture is Locking Piece (1963-4, Millbank, London: Henry Moore Foundation). Another important British sculptor is Barbara Hepworth (1903-1975). Like Henry Moore she held her first exhibition in 1928; in fact these two sculptors came from the same district and attended the same art schools. But apart from a short period during the 1930s when they were working on similar problems in sculpture their aims were basically different. The human figure never appears in the typical work of Barbara Hepworth. Her sculpture is completely abstract in intention: a form of non-objective art, based on geometric and other basic shapes. Her carvings have such titles as 'forms', 'spheres', 'sculpture with colour' and so on - titles which emphasize the fact that they are not intended to represent or suggest any living thing. There is one in the Tate Gallery, for instance, called 'Bicentric Form'. Other works in London by Barbara Hepworth include the abstract figures on the front of the Festival Hall, 'Meridian' at the State House and 'Orpheus' in brass at Milliard House. In New York, her memorial to Dag Hammarsjold - Single Form (1961-4) - stands next to the United Nations Building. Hepworth began working in the same abstract manner from the early 1930s onwards, which was un-fashionably early for abstract sculpture in England. Her work didn't arouse the same display of public displeasure as that of Epstein and Moore although it was perhaps more true to the first principles of modern art and associated abstraction. As we have seen, it was difficult for the public to become as passionate about a work of completely abstract art as they could, and did, become about works which showed distortions of the human figure. The English painter and sculptor Ben Nicholson (1894-1982) produced at this time, during the 1930s, a unique sort of monochrome relief sculpture - entitled "white reliefs". These works consisted of hardboard panels in low relief in a formal geometric spirit. They are a severely abstract form of concrete art and are interesting apart from their aesthetic values in that they come part way between painting and sculpture. During the second half of the 20th century the division between painting and sculpture became very difficult to define. Paintings were often built up into high relief, the traditional frame and formal rectangular shape of the picture were often abandoned, transforming the picture into a kind of 3-D relief. Sculpture, on the other hand, began to resemble shallow reliefs, sometimes in plastic or scrap materials, which hung on the wall like a picture. A sculptor named Cesar (Cesar Baldaccini) (1921-98) even used scrap metal, usually in the form of motor car bodies which were commercially compressed into bales or bundles for the scrap metal trade. From these Cesar created sculpture, including semi-sculptural reliefs which look very much like some of the paintings of the American 'action' painter, Jackson Pollock (1912-56). With the end of the Second World War a number of new British sculptors began to emerge as important artists, but it was not until the 1950s that their work achieved real distinction for British sculpture on an International level. This was an astonishing and most unexpected achievement for a country whose public had so strongly resisted the influence of modern art. Until then, the only modern artists in Britain who had been able to develop sculpture sufficiently to achieve an international reputation abroad were Jacob Epstein, Henry Moore and Barbara Hepworth. So it was very surprising indeed when a whole group of British sculptors, not only Henry Moore and Barbara Hepworth, whose reputations were already made, but including a younger generation of sculptors, won many prizes and distinctions with work which was acclaimed and exhibited throughout Europe and North and South America. And they continued to win prizes and acclaim throughout the 1950s. The outstanding sculptors in this younger group were Reg Butler (1913-81), Lynn Chadwick (1914-2003) and Kenneth Armitage (1916-2002). The general trend of their work at that time was the last stage of representation, where representation is disappearing, and the abstract has taken over. Their sculptural forms are basic and belong to geometry but there are disturbing human echoes in the work, particularly in their general silhouette. In order to achieve a sense of sculptural 'mass' Kenneth Armitage increased the size of the bodies of his figures and reduced the importance of their extremities. Heads, arms and legs become mere knobs or stick-like additions to the figure. Armitage has also taken this idea a stage further by using not one but many figures made up into a single big form. The work of Lynn Chadwick, who won a prize with his design for a monument to the 'Unknown Political Prisoner', was less concerned with the human figure than Armitage and Butler. His sculptures create a strange imaginative world of insect-like beings, spiky birds and beasts, sharp, angular and menacing. Reg Butler, who in 1953 won the Grand Prix in the International Sculpture Competition with his maquette (small sketch model) for a monument to the 'Unknown Political Prisoner', shows in his later work a return to a more traditional way of working. His work in this manner is wholly representational. The modelled surfaces have the same kind of texture as Rodin's work but the figures are slightly distorted in order to emphasize the pose. Although they are representational, these works are very 'modern' in their effect. There is a bronze 'Girl', typical of this phase in Butler's work, in the Tate Gallery, where there are also examples of the work of Chadwick and Armitage. For an international sculptor working in a not too dissimilar style, see the Swiss artist Alberto Giacometti (1901-1966). There is no room to mention all the various styles and working methods used during the 1950s. Some sculptors were working in the idiom of constructivism, others in the medium of kinetic art (mobiles and other moving sculpture). Metal was used more and more, often in the form of cut-out or forged pieces of iron welded together. Other sculptors used machine and scrap-metal parts which they welded together as recognizable pieces. For other sculptors associated with kineticism, see: Naum Gabo (1890-1977) and Jean Tinguely (1925-1991). For those involved with metal, see: Mark Di Suvero (b.1933) and Richard Serra (b.1939). Much interest was shown during the 1950s in the textural treatment of the surface of sculpture. Texture can emerge naturally enough through the character of the material and the way which it is formed. Soft modelled clay, or terracotta sculpture obviously has quite a different surface quality from that of chiselled wood or stone; while hard stone has a different surface quality from that of soft stone. The earlier 'modern' sculptors were very much occupied with the idea of the correct surfaces for the different materials which they used; 'Truth to material' was one of their working rules. Henry Moore's love of 'natural' stone surfaces was arrived at through this conviction. But in the 1950s, some painters and sculptors became interested in surface texture for its own sake. Another influential figure in British post-war sculpture who began working with metal was Anthony Caro (1924-2013). An assistant to Henry Moore in the early 1950s, Caro switched from figurative representational art to metal abstract sculpture after meeting the abstract American sculptor David Smith (1906-1965), in 1959. His groundbreaking style of abstraction is exemplified by Early One Morning (1962, Tate Gallery, London). Experiments such as these can be thought of as exercises through which the artist learns about the character of his material, its qualities and its possibilities of development. The use of a material never before used for the making of sculpture means, of course, that the artist has to invent a new way of working. He has seen in this material a new kind of beauty which perhaps nobody has appreciated before and he must develop this in a way which satisfies him as an artist. Any usable material, traditional or not, will suggest its own correct manner of treatment to a sensitive artist. New or non-traditional materials can thus not only provide a fresh approach for a creative artist but could lead to the discovery of new kinds of beauty. The merit of any technique, however, depends entirely on the merit of the artist who uses it. The work of a bad artist would still be bad even if it were cast in pure gold. The work of a good creative artist can be good even if he works in scrap materials. In the hands of later artists, 'collage' developed into popular or 'pop art' but photographs and magazine cuttings are usually employed for this kind of work. (The Victorians also used the idea extensively for covering screens, etc., in the manner of a scrap-book.) The inclusion of real objects adds a new quality to a work of art and many artists have taken advantage of this. The use of recognizable pieces of scrap machinery has already been mentioned, together with 'Assemblages' which carry the idea to its limit. Assemblages are arrangements of objects and parts of objects and belong to the idiom of 'scrap' sculpture. Another way of using real objects was introduced in 1913 by a French artist, Marcel Duchamp (1887-1968) - regarded as the father of junk art - who exhibited a bicycle wheel unadorned and 'factory fresh'. This was perhaps the first example of this kind of thinking and exhibits of this nature became known to sculptors as 'ready mades'. The artist was drawing attention to the beauty of a very ordinary and unconsidered product of his age. Duchamp repeated this performance two years later with a snow shovel, which he called 'In Advance of a Broken Arm'. 'Ready mades' have appeared regularly enough in exhibitions ever since. A variation on this aspect of realism appeared in the exhibition 'British Sculpture in the Sixties', held in the Tate Gallery in 1965. Entitled 'Mounted Infant' it comprised a small table and a corner cupboard with very few additions. It suggests a small boy sitting on a horse but its main interest lies in the fact that it is completely cast in bronze. It could hardly look more real, more like a table and a cupboard if it were still in its original state. We see that the intentions and ideas of the pioneers of modern art have, after many years of positive resistance, gained a foothold in England. But whatever the reasons for the greater tolerance on the part of the public during the 1950s it has enabled artists here to develop their work with greater freedom. Consequently British sculpture has been able to shake off every remaining restriction of traditional ways of working. There are now few barriers in the way of the sculptor, he is free to work in any way he wishes. The Spanish genius Pablo Picasso (1881-1973) showed that an artist was free to change his way of working any number of times throughout his lifetime. In matters of art this change need no longer be a drawn-out emotional or instinctive process of slow change, the slow inevitable development of artists working over long periods of time. Neither, argue the challenging young sculptors of today, need the learning of his craft take a sculptor a lifetime. The sculptor's paid assistant is back. Except today he is not likely to be the professional stone-carver, for although Henry Moore and Barbara Hepworth have for a long time employed stone-carvers as paid assistants, sculptors are at the present time reacting against stone as a material for sculpture because of its strong traditional associations. The professional assistants employed by sculptors in today's era of contemporary art, are more likely to be computer software experts, or computer-assisted design experts. All this is a reaction against traditional ways of working: the further an artist can get away from traditional work the more 'modern' or 'contemporary' or up-to-date and forward-looking his work is likely to be. Today's postmodernist art is being made by new generations of postmodernist artists who were born long after the original battle against traditionalism, waged by the activists of Cubism. But art does not reach a kind of 'perfection' and then stay like that for ever, because what is right for one age may be quite wrong for another. It is foolish to say that a statue is revolting or bad simply because it does not resemble one carved in Renaissance Italy 400 years ago or in Ancient Greece 2,000 years ago. A fine work of avant-garde art is no better or worse than fine work done hundreds or thousands of years ago. But it is and must be different. If it is not, then it is merely a copy of something from the past, and does not truly express the thoughts, feelings or ideas of the artist or of his time.  For more about contemporary sculptors, see: Young British Artists (1980s).  For postmodern forms of sculpture, see: Installation art.  For individual artists, see: Damien Hirst (b.1965) and Tracey Emin (b.1963).  For others, see: Antony Gormley (b.1950) and Anish Kapoor (b.1954).  For awards, see: Turner Prize (1984-present). Examples of modern British sculpture from the period 1930-70 can be seen in several of the best art museums and sculpture gardens around the world.  For more about 20th century sculpture in Britain, see: Homepage.